Kansas Governor Jeff Coyler talks with the media during an election night gathering on Tuesday, Aug. 7, 2018, at the DoubleTree Hotel in Overland Park, Kan.
Kansas Secretary of State Kris Kobach handed over his election responsibilities Friday to a top deputy who is known as a staunch conservative as he remains locked in a tight race with Gov. Jeff Colyer for the Republican nomination. Kobach, who argues voter fraud is a significant problem, also accused Colyer of using rhetoric that may undermine public confidence in the election process. As of Friday afternoon, Kobach held a lead of 59 votes. Assistant Secretary of State Eric Rucker will take over Kobach's duties and will serve on the State Board of Canvassers, which will certify the final election results. Rucker donated $1,000 to Kobach's campaign last fall, according to campaign finance records. "Although I would discharge my duties ethically, impartially and responsibly, I have carefully considered your request and have decided that it is in the best interest of the citizens of Kansas that I permit another to perform the duties of the secretary of state until the conclusion of the 2018 primary election process," Kobach said in a letter to Colyer on Friday afternoon. [post_ads]Kobach's letter came in response to a letter from Colyer on Thursday that demanded Kobach recuse himself from giving election advice to county election officers. Kobach rejected allegations from Colyer that his office was giving election officials incorrect advice. "As governor of Kansas, your unrestrained rhetoric has the potential to undermine the public's confidence in the election process. May I suggest that you trust the people of Kansas have made the right decision at the polls and that our election officials will properly determine the result as they do in every election," Kobach said. In response, Colyer campaign spokesman Kendall Marr said Rucker is a "good and decent man" but said his appointment doesn't address their concerns about a conflict of interest. Colyer wants Kobach to ask Attorney General Derek Schmidt to provide legal advice to county election officials. "We hope he will reconsider our request to allow the attorney general to provide proper legal advice to county elected officials to reassure Kansans that the election between Secretary Kobach and Gov. Colyer is free from conflicts of interest," Marr said. "I will not breach the public trust and arbitrarily assign my responsibilities to another office that is not granted such authority by the laws of Kansas," Kobach said. Rucker found himself under scrutiny by an attorney disciplinary panel in 2010 that had looked into how Kline's office conducted itself as it investigated the late Wichita abortion doctor George Tiller and Planned Parenthood in Overland Park. Kline's office faced a far-reaching investigation into complaints that he misled judges and a grand jury during the probe into abortion providers. While Kline would later have his law license suspended for what the Kansas Supreme Court found to be "clear and convincing evidence" of professional misconduct, Rucker in 2010 received an informal admonition for not correcting misleading information he provided to the state's highest court. Rucker's attorney in that disciplinary case was Caleb Stegall, who would later go on to serve as former Gov. Sam Brownback's general counsel before becoming a justice on the Kansas Supreme Court. Rucker was also the subject of a lawsuit last year from a former employee in the secretary of state's office. The former employee alleged in the federal lawsuit that her situation was a case of "reverse religious discrimination," and described Rucker as telling her grandmother that she had been fired because the staffer was a diversion, mean and didn't go to church, with Rucker placing a particular emphasis on church as a factor. The jury rejected the employee's claim, though the trial provoked further scrutiny of Rucker's work within the office. Democratic state Rep. John Carmichael of Wichita said he had assumed that Kobach would turn over his responsibilities to an election professional within the secretary of state's office. "However, it appears that the secretary is not sensitive to the appearance of impropriety and by appointing his longtime right hand Eric Rucker he is not eliminating the appearance of impropriety but only transferring the responsibility to another one of his political cronies," Carmichael said. "I have full confidence in Mr. Rucker's ability to carry out these responsibilities," Kobach said. Kobach's lead over Colyer stood at 59 votes on Friday afternoon, as vote counting continued in the closest Kansas Republican primary for governor ever. The new results from the secretary of state's office came as counties reported votes from mail-in ballots that arrived after Election Day. But it was unclear where the total would stand at the end of the day. The vote count is expected to change. County canvass boards will begin meeting Monday to sift through provisional ballots, with two large counties - Sedgwick and Johnson - both set to meet Monday. Provisional ballots are cast when a voter's eligibility is in question. Kobach's lead, placed at 191 votes at the end of vote counting Wednesday, shrunk Thursday as additional votes for both Kobach and Colyer were discovered in multiple counties. In Thomas County, Colyer received 100 more votes than what the secretary of state's office reported on election night. 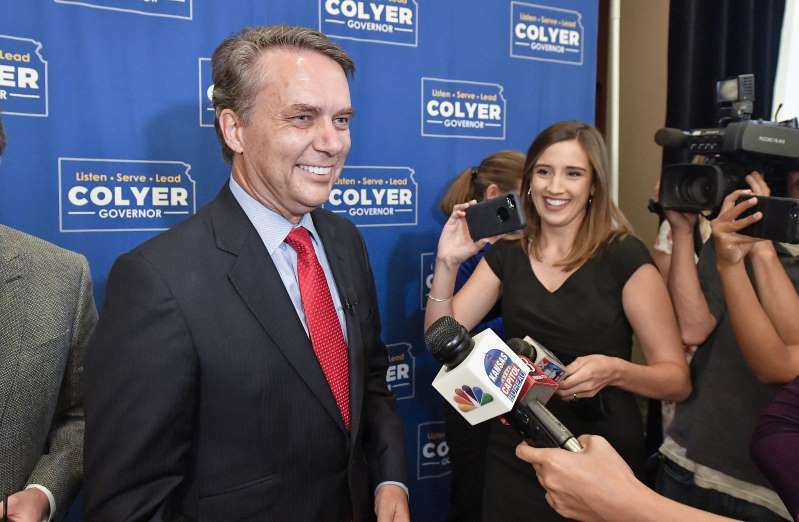 Colyer's campaign hired former U.S. Attorney and current Missouri Republican Party Chairman Todd Graves to assist with the legal labyrinth in the canvass and likely recount in the primary election. Kobach, who as secretary of state is the chief election official in Kansas, agreed Thursday to recuse himself from any role in a vote recount. Kobach's office has already drawn criticism from Colyer for allegedly instructing county clerks to disregard certain mail-in ballots.